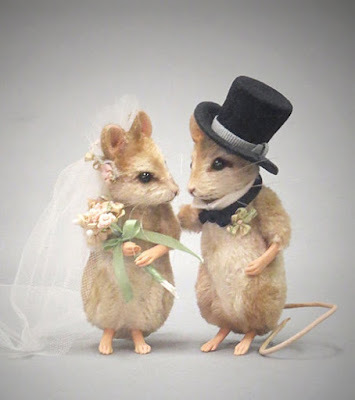 Miss Mouse Was So Beautiful That Her Parents Decided to Marry Her to The Most Powerful Being on Earth. So, They Set Out in Search of a Bridegroom. ’ Sorry,’ Said the Parents of Miss Mouse, Turning to Go, But We Want Only the Most Powerful Being to Marry Our Daughter. They Went to The Rain, Who However Said That the Wind Was Stronger Than He, For Rain Clouds Were Always Being Driven About by The Wind. So, They Went to The Wind, Who, Although Willing to Marry Miss Mouse Admitted That He Was Not the Most Powerful Being, For He Had Never Been Able, However Hard He Tried, To Blow Away the Mound, Who Always Stood in The Wind's Way. So, They Went to The Mound, Who Told Them That the Bull Was More Powerful, For the Bull Came Every Evening to Sharpen His Horns Against the Mound, Breaking Chunks Off It in The Process. So, They Went to The Bull, Who Regretted He Was Not the Most Powerful Being, For He Had to Turn Right and Left According to The Orders of The Rope, Which Acted as The Reins in The Bullock Cart Driver's Hands. So, They Went to The Rope, Who Was Over-Joyed at The Prospect of Marrying the Beautiful Miss Mouse, But He Also Had to Admit That There Was One More Powerful, Namely the Mouse Who Lived in The Cow-Shed, For He Came Every Night to Gnaw at The Rope. So, The Mouse Who Lived in The Cow-Shed Was Chosen as The Bridegroom. He Was Found to Be a Strong and Handsome Fellow, A Worthy Mate for Miss Mouse.